We love bicycles, and at BUMSONTHESADDLE we aim to share this passion with as many people as possible. Biking to Work can be one of the simplest things most Bangaloreans can do to kick off a fantastic day. The BOTS “Wheels of Change” project aims to get more people biking to work via corporate workshops, partnerships, events and simply sharing the joy of cycling to work! On her way to work, she stopped at the signal as it turned red. A little school going kid points at her and expresses to the mother riding the scooter, “I want to be like her”. 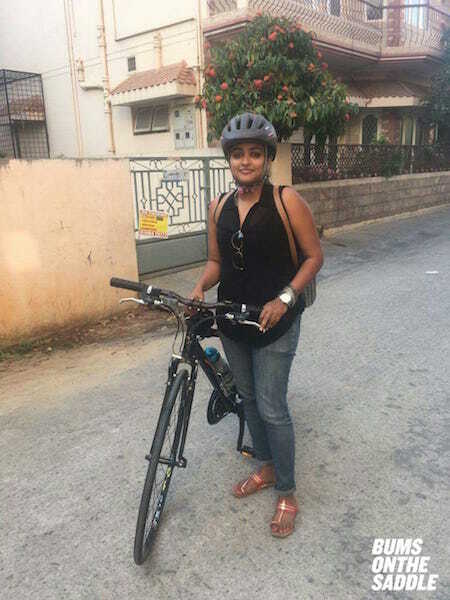 Meet Divya Kottadiel who has been riding her bicycle to work ever since she moved to Bangalore. She cycles from Ulsoor Lake to Basavangudi every day where more than 90% of the route is through the busy streets with heavy traffic. Initially she found it daunting, however, she made consistent efforts and eventually learned to negotiate the traffic and the busy junctions. She kept at it simply because cycling to work is fun, sustainable, economical and she reached her workplace and home faster, fitter and happier. Divya works for World Resources Institute(WRI) and as an environmental organisation, they encourage active modes of commute. A lot of them at WRI bike to work and sometimes they face space crunch while parking their bikes! That’s a lot of bikes! Divya says its great to see a lot of people using bicycles for their daily commutes. As the number of cyclists on road increase, the safer the roads will be, she adds. Divya rides a KHS Vitamin B, 20km everyday since 2015. She has also spent time riding on weekends but mostly enjoys cycling to work. She’s also a pianist, a baking enthusiast and enjoys running outdoors. Thanks Divya for being awesome and doing your bit for the city!